Remember South Park? Its the adult animated sitcom which was created by Trey Parker and Matt Stone for Comedy Central Television. 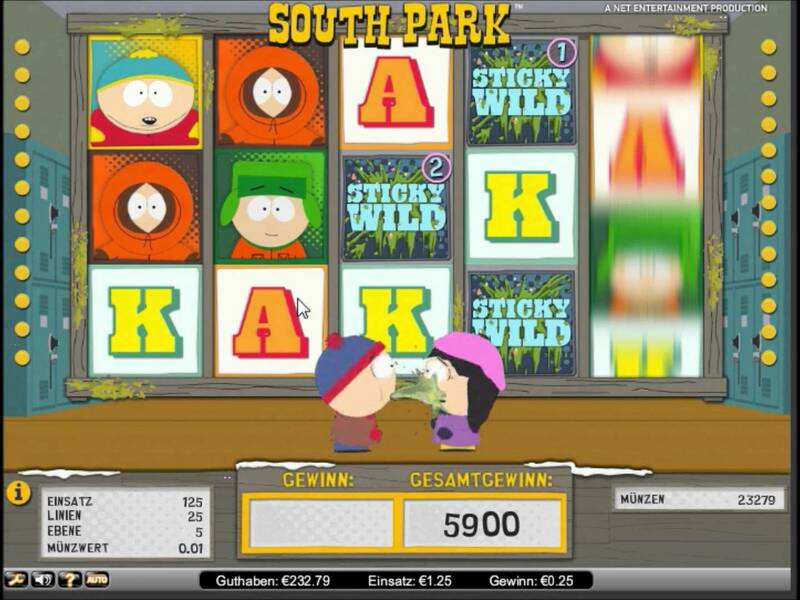 Well now thanks to NetEnt you can play South Park in the great form of a video Slot game. You can see its infamous characters Cartman, Stan, Kyle, Kenny and Butters as symbols each time you spin. The show is well known for its crude language, dark and surreal humour which satirizes many topics, some on the very verge of controversy. Nevertheless their bizarre and amusing adventures are entertaining and incredibly popular. On the South Park Slot there is an abundance of features and bonuses. To unlock any of the above bonus spins you need to spin 2 regular bonus symbols, this is an easily recognisable symbol, it has a predominately red background with a yellow and orange border with the word ‘BONUS’ in bold yellow writing. The symbols must appear in reels 3 and 4 with a character bonus being present on reel 5. Rather specific requirements to enter the bonus rounds but once you do enter you can win big. As in the show where Stan frequently vomits on Wendy this also occurs in the game and this becomes your sticky wilds. If you’re not already familiar with a sticky wild, this is then a particular symbol is designated as a ‘sticky wild’ and when appearing on the reel it stays in play for an amount of time, in this case it stays for 2 spins when appearing in the middle of reel 3. As soon as you activate this feature you are granted 10 free spins, from this you should keep an eye out for Ike (Kyle’s baby brother in the show) if Ike appears on reel 5 you will see Kyle kick Ike into touch bouncing onto 1 of the 5 prizes which are shown on the below reels. A new feature to this bonus is that you start with 3 lives once to spin the combination allowing you to play the Kenny Bonus Spins. Here you are attempting to get Kenny through three different zones. Here you chose 1 out of the 3 highlighted options available for Kenny, so choose wisely as this feature will end when Kenny runs out of lives or reaches the final zone. If you’re successful enough to reach the final zone you win a considerable amount in the shape of 2,500 coins. In this feature Cartman searches the bushes for hippies, hippies happen to be Cartmans sworn enemies. You will see 8 bushes appear, you will need to choose one. Present is also a police officer which you need to avoid disturbing, if disturbed twice the feature will come to an end. Terrance and Phillip Mini Feature: Within play Terrance and Phillip will appear on the reel, anywhere the go will reveal a wild. There are 3 wilds randomly positioned anywhere on reels 2,3 and 4. Mr Hankey Mini Feature: 3 to 5 wilds are are positioned anywhere on reels 1,3 and 5. On occasion you’ll see Mr. Hanky appear with the theme song playing in the background as he lands in particular sections of the reel revealing wilds. We here at All NetEnt Slots have played on the slot a number of times so we’re very familiar with all of the entertainment and winning factors. This slot has a high entertainment and engagement factor attached, we really enjoy playing, however we didn’t seem to win big and that’s what we’re always looking for. We did experience the mini rounds several times which did contribute to us winning something plus it kept us playing for longer. Hopefully the next time we play we finally hit the Cartman bonus spins. South Park online slot a great slot to play and we very much recommend giving it a go, especially if you’re a South Park fan, you’ll enjoy seeing most of the characters pop up throughout the game.